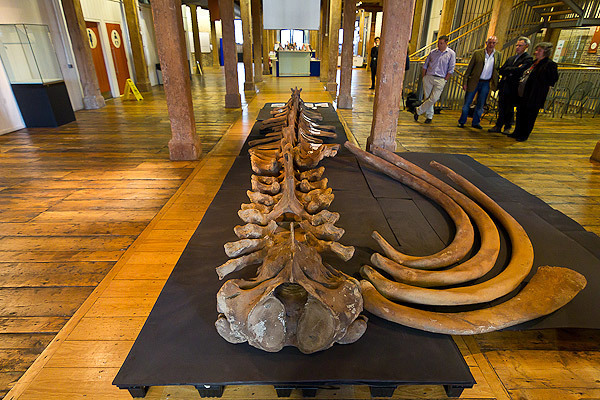 The half-tonne, headless skeleton of a Northern Atlantic right whale, discovered during excavation work at Bay Wharf in Greenwich, has gone on temporary display at the Museum of London Docklands, in Canary Wharf. The whale is believed to have died two centuries ago, and was possibly between 50 and 100 years old when it made the mistake of swimming near to the mouth of the Thames, where it was probably harpooned and dragged upriver to be butchered for its valuable oils. Whales in the Thames aren't that uncommon: after the sad death of the northern bottlenose that captured the public's imagination in 2006, the Zoological Society of London reported that between July '05 and June '06 there were four whale sightings in the River, while a few years back Mexican artist Gabriel Orozco brought a roqual whale skeleton to the White Cube. There are also parts of a bottlenose skeleton at the Grant museum. But to find a near-complete skeleton is quite rare, and as the Museum of London's senior curator of archaeology, Francis Grew, points out, it is probably the largest single object ever found on an archaeological dig in the capital. The skeleton will be on display to the public in the Museum of London Dockland's foyer until September 14th, after which it will be moved to the Natural History Museum for further analysis.